Attention all Back To The Future fans: If you're in the market for a new hard drive, then the folks over at Flash Rods have something just for you. 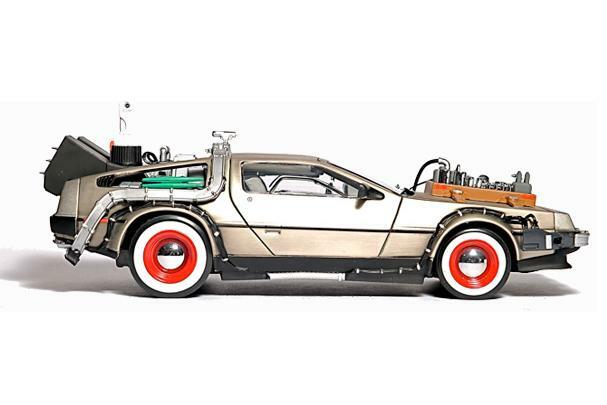 Flash Rods latest, known as the Delorean Time Machine Hard Drive, contains a 500GB Seagate drive within the chassis of the much-loved Delorean from the Back To The Future trilogy. The replica Delorean is a stainless steel 1:18 scale model, complete with a Mr. Fusion energy reactor, working doors, and most importantly of all, a flux capacitor. But in the interest of keeping your data safe (and here in 2010), whether you manage to get this miniature model to reach 88MPH or not, the flux capacitor doesn't function. The hard drive, which is a perfect match for Mac-owning Time Machine users, is available now for US$250. Sure, $250 is a little pricey for a 500GB drive, but any die-hard fan can just grab a copy of the Sports Almanac and make their Delorean storage dreams a reality.